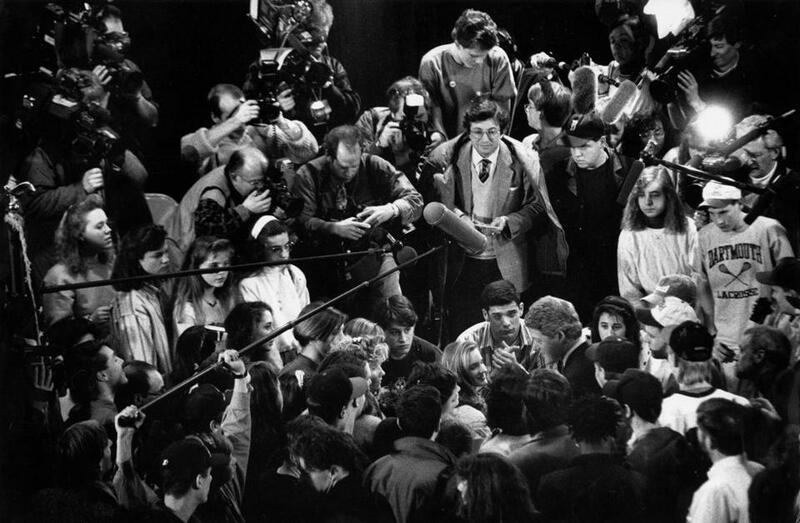 Journalists and high school students surrounded Bill Clinton during a campaign stop at Concord High School in New Hampshire in 1992. Back when my wife and I worked as photographers in New Hampshire, it was always fun photographing presidential candidates who swarmed the state. Bill Clinton was probably the most memorable. We met him many times, but three encounters stick out most in my mind. The first was when I was waiting on the steps of a synagogue in 1991 or ’92. Then-Governor Clinton and his driver pulled up at the curb, and just the two of them hopped out. Seeing him alone, with no entourage, wasn’t weird at the time. He was just another guy looking to lead the free world. He shook my hand, introduced himself, asked my name, then moseyed along inside. The second moment that sticks out was after he became president. I was told that a photo I took of him as a candidate was the Clinton family’s favorite shot from the campaign. So, being an opportunist, I had two nice enlargements printed up. I sent them both to 1600 Pennsylvania Ave., saying they should keep one, but sign and send the other back if they didn’t mind. Months later, I got a call from the president’s secretary thanking me. Soon thereafter, she sent back one of the photos, signed, and with a personal note. I’m told that picture hung in their residence for years. But enough bragging. Street level politics, New Hampshire style, was never any more apparent for me than when the president came back to the Granite State months after it made him the “Comeback Kid.” Seemingly everyone in New Hampshire showed up in Concord to line the streets. Clinton again got out of his car, this time surrounded by a bazillion Secret Service agents. He began walking down a row of people on South Main Street, coming closer and closer. As a good photographer should, I had a telephoto lens on my camera but also a wide-angle lens for when he got close. And I realized the Secret Service had already spotted me and were on the case. I have since wondered what would have happened had I made a sudden move toward my bulging pocket that day. I’ll bet I would have known what hard cement, or the familiar granite curbs, really tasted like.